Not quite a chemistry textbook, this look at LSD’s discoverer delves also into what this particular formula meant for society. 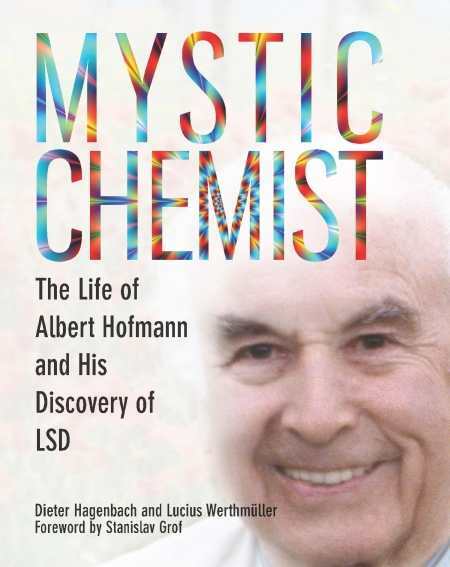 Mystic Chemist by Dieter Hagenbach and Lucius Werthmuller discusses the life of Albert Hofmann and his discovery of LSD, as the subtitle promises—but the book also gives a broader look at the social and political forces that influenced both Hofmann’s life and his discovery of the drug. The book is a treasure trove of scientific history. It covers Hofmann’s early life and education through his legacy, which continues decades after his discovery. Readers will be intrigued to follow a young, nature-loving child as he grows up against the background of World War I and becomes one of the most controversial and influential scientists of the twentieth century. The book also looks at the process of discovery and the other scientists who were involved along the way. The book has the layout and quality of a textbook, yet the tone is slightly more personal than a typical academic work. Both authors have personal connections to Hofmann. Hagenbach was friends with Hofmann beginning in the 1970s, and Hofmann was friends with Werthmueller’s parents and later Werthmueller himself. As a result, the writers’ interest and urgency toward the subject is evident, but their in-depth research (pages and pages of sources) keeps their personal experience from clouding their objectivity. The authors give voice to the controversy surrounding LSD’s uses and dangers, but their portrayal leans toward a positive view of the drug. Conservative readers may find this view permissive or irresponsible, but the authors’ views on science and LSD are typical of the social and ideological liberalism of Europe—both authors are from Basel, Switzerland. Hofmann’s face seems to be creepily emerging straight from the book cover—perhaps that’s intentional, but a sharper photo would better convey the seriousness of the book. Mystic Chemist is full of photographs of artifacts, people, and experiments relevant to the text. The image quality is sharp and bright. The paper stock is thick and glossy, perhaps a bit too thick—it’s hard to get the book to stay open. The writing is accessible to most educated readers, but the content will appeal primarily to those with an interest in chemistry. Readers with a more sociological and psychological bent will most value the book’s ventures beyond just science to discuss the cultural and mental effects of scientific discoveries through its specific look at LSD. The authors recount stories of people and whole generations who, like Hofmann, were transformed by LSD—and how broadened minds meet opposition from cultural norms. True to its textbook form, the authors largely leave conclusions up to the reader.